- Attempted land grabbing of the Lang'ata Road Primary School playground. The policy working paper was launched by Sam Kimeu, Executive Director - Transparency International and Regina Opondo, Executive Secretary - Constitution & Reform Education Consortium (CRECO). According to the Transparency International-Kenya Report (2014), Kenya scored 25 on a scale of 100, down two points from 2013's score of 27, signifying that corruption is worsening. According to the latest Auditor General's report, only 1% and a quarter of the Governments' budget was properly accounted for. Negative political utterances are no the rise and as Kenyans continue to die from insecurity and terror attacks, security agencies continue to conduct security operations that have resulted in over 120 egregious human rights violations. Despite these challenges, the civic voice is louder today than ever before. The courageous action by pupils and teachers of Lang'ata Road Primary School set precedence in the struggle to reclaim stolen public land across the country. Progressive hashtags such as #147NotJustaNumber demonstrate the power of citizens to mobilise effectively. The protest by 900 women on the streets of Nairobi resulted in the introduction of new stiff sentences for stripping and assault. The year 2015 has seen Kenya cross the threshold to become a low-meddle income country. Kenya has continued to carve out a distinct place in the community of nations. Structured a moderator and discussants, SID Mjadala VII discussion brought together key civic actors at the end of 2015 to reflect on strategies for re-igniting hope and agency behind the constitution. Panelists included: Ory Okolloh-Mwangi (Director of Investments, Omidyar Network, activist and lawyer), Barrack Muluka (Editor, Mvule Africa Publishers, and opinion leader on integrity issues). The discussion was moderated by Renee Ngamau, co-host - Capital in the Morning, Capital FM. 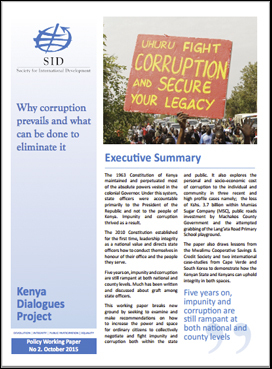 On the occasion of the celebrations, the National Integrity Alliance (an advocacy group including SID, the Coalition of Citizens Against Corruption, Angaza Writers, and Transparency International - Kenya) called on all leaders and citizens to act urgently to breath life into the value of integrity enshrined in Chapter 6 of the Constitution of Kenya. A press conference was organized on November 5th 2015, that contributed to the reshuffling of the National Government Cabinet and introduction of 17 directives contained in a presidential statement issued on November 23rd 2015. The 2015 International Anti-Corruption Day celebrations aimed at saluting the power of active citizenship in disrupting corruption and demanding accountability as well as inspire increased, direct citizen engagement in the fight against corruption. Seven people have been recognised and awarded as integrity champions for their work in shining the light of integrity and fighting corruption in their own spaces. - Francis Kahirio Mwangi - Headteacher, Naka Primary School, awarded for his efforts to reclaim and secure 10 Ha, of Naka Primary's school land that had been grabbed. - Lucy Nyambura Ng'ang'a - For her continued efforts to advocate for transparency and accountability in the disbursement of funds in Trans Nzoia County Youth Sacco. - Catherine Wither Gicheru - A practicing journalist who wrote a series of explosive reports. - Brian Odhiambo - Went above and beyond the call of a paramedic to sustain the life of the late Mr. Alex Madaga for over 18 hours after hospitals with the ability to save his life denied Alex treatment. Brian's actions and persistence brought to the fore the issues that plague Kenya's health care system. - AfriCOG - In addition to standing firm in the defence of Post-Election violence victims and their equal right to justice, AfriCOG continues to produce research that highlight and reveals corruption and other ways through which public resources are either misused or stolen by those entrusted with its protection. - National Land Commission - NLC has continuously demonstrated its commitment to protect public lands evidenced working with ShuleYangu Campaign to ensure that all public land in Kenya is titled.